Caption: Senior pitcher Cooper Wetherbee throws a pitch. 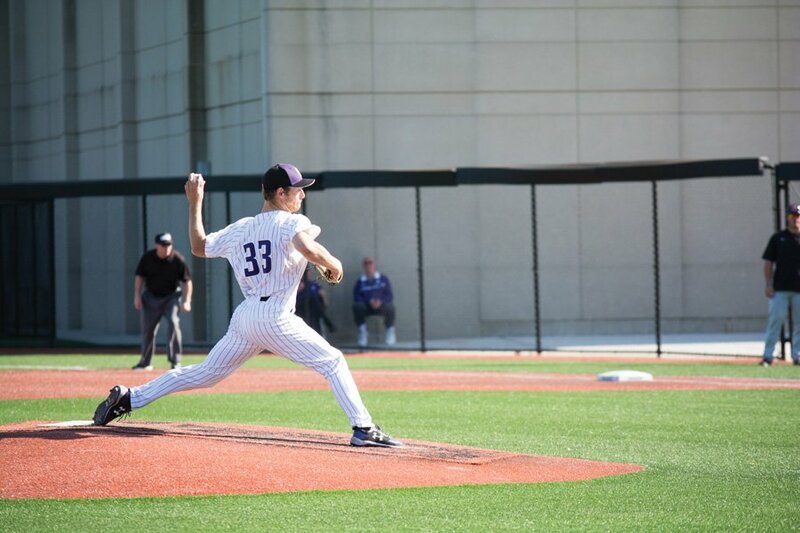 Wetherbee struck out nine batters in 6.2 innings of NU's Sunday win over Maryland, but watched his college career end in the Cats' loss to Iowa later in the day. A team that no one expected to do anything, a team that lost almost 40 games a season ago, a team that started the season 0-7, played for a Big Ten Championship on Sunday. Northwestern (27-30, 13-11) came up short, losing 13-4 to Iowa to end its season in the Big Ten Tournament finale. Coach Spencer Allen, though, was anything but disappointed in the result. The Wildcats began the day on a much higher note, taking down Maryland 6-5 to reach the championship game. Saturday, the Terrapins had topped NU 9-5 to force Sunday’s game, but senior Cooper Wetherbee shut down the Terrapins’ bats on the day, and the Cats hung on to win. In his 2016 junior season, Wetherbee put up a ghastly 8.89 ERA in over 20 innings of work. This year, he was carving up a Maryland lineup that hit .277 on the year with 59 home runs. The Terrapins got only two runs of the senior in his 6.2 innings, as he struck out a career-high nine batters and tossed an immaculate fifth inning. In their last day with NU, seniors Joe Hoscheit and Matt Hopfner combined to go 5-for-10 across the two games. Hoscheit joined junior Connor Lind, freshman Sam Lawrence and Wetherbee on the all-tournament team. Against Maryland on Sunday, Hopfner went 3-for-4 while scoring a run and coming through with the game-winning RBI. He ended his career third in school history in hits with 240, passing two-time MLB all-star Mark Loretta on Sunday by picking up four hits. After defeating Maryland, the Cats had a shot at the program’s first NCAA Tournament appearance since 1957, but it was not to be against the powerful Hawkeyes offense. Iowa put up five runs in the bottom of the first and didn’t look back, eventually finishing with 13 runs on 14 hits, including two bombs from Big Ten Player of the Year Jake Adams. While NU came up short in its ambitious tournament push, the season was unquestionably a success for the Cats. The underdogs defeated three of the top four teams in the conference in Michigan, Minnesota and Maryland while bouncing back from a 6-18 record in early April to finish with 27 wins, the most for the program since 2000.